Good Morning! I'm back with another Whipper Snapper card! 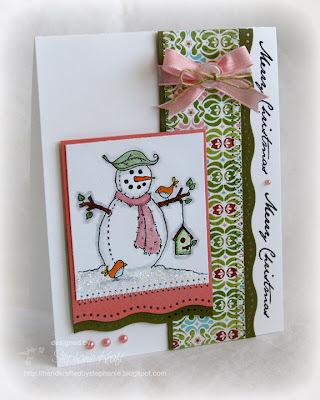 This one features the oh so cute snowman from Anna Wight's newly release set, Spirit of Christmas. Isn't he just adorable? I love everything about him... from the cute leaf on his head to the birds and birdhouse! For my layout, I used Cindy's latest Crazy 4 Challenges sketch, C4C3, though I did move the trio of pearls to a slightly different spot. I went for more of a clean and simple look this time and used some non-traditional Christmas colors. Accessories: Dotted Wave border punch (EK Success), Markers (Copic), Star Dust Stickles (Ranger), Pearls (Kaisercraft), Ribbon, Button, Twine (May Arts), Foam tape, Thread, Sewing machine. He's just adorable! I really like those colors together for a Christmas card, too. Such a cute card! I love his leaf hat. Awwww, LOVE that WS image and all the wavy borders look fantastic! AWESOME card! Just so pretty, thanks for playing. This is darling!!! Love the row of stitching under the snowman and that DP is my favorite EVER from Basic Grey!! Ooooh, I love these colors and the stitching on the image is a perfect touch. Great idea to use the sentiment on the edge like that too! Just beautiful! Oh Stephanie, this is absolutely DARLING! I love the colors and the snowman is SO cute!